One of the ironclad truths in rugby is “the older we get, the better we were”. It applies at all levels of the game and allows for sepia toned nostalgia and the swapping of tall tales and whenever old comrades meet up. Mick Cleary recently opined that the current All Blacks are good but nowhere near the best ever. He goes through the players and name checks Mils Muliaina as one of the reasons. Mils is a cracking player but he hadn’t started a test in about a year when the article was penned. C’mon Mick, try harder, Israel Dagg has started 18 tests and scored 11 tries, he’s worth a look. The Welsh team of the 1970s get a name check (see “sepia toned nostalgia”). Sure, they were good, but they never beat NZ. Their illustrious period was book-ended by getting mauled by the All Blacks in 1969 and Andy Haden falling out of a lineout in 1978. OK, the backbone of the ’71 Lions were Welsh, but would they have won without Mike Gibson, Willie John McBride, Gordon ‘the Broon of Troon’ Brown and David Duckham? The 1969 All Blacks themselves were pretty awesome and maybe their tour to SA in 1970 came a season too late but they couldn’t get it over the line and it would be 1996 until Sean Fitz’s men claimed NZ’s first series victory in the republic. It’s not a scientific argument at all though and is more a story of claim and counter claim. In that vein, and seeing how he has announced his intention to take a six month sabbatical in order to extend his career until the 2015 RWC, the Mole has to say that Richie McCaw is the greatest player he has ever seen and just might be the greatest ever. McCaw captained his team to an incredible 32-16 win against the Boks in Jo’burg at the weekend. This came a week after scorching Argentina in Buenos Aires, taking a flight across the South Atlantic, changing time zones, adjusting to altitude and playing their greatest foes in front of 80,000+ spectators. The penalty count against them after about an hour was 9-0, which says something about a McCaw captained team, but NZ ended with the bonus point. Two moments from many stood out for me. One was when Adriaan Strauss, going low, carried the ball around the corner as NZ were making a goal line stand. McCaw launched himself at Strauss, got underneath him, turned him off balance and drove him back. The ball popped forward from contact and NZ cleared their lines. It was only due to the slow motion replay that one was able to see McCaw’s paw flick the pill back towards his own team. It was illegal, but it was awesome. The next was when fresh legged sub Tamati Ellison made a break in a wide channel, beat a man and linked with Conrad Smith who took it forward until realising that his best option was to lay it off to his support inside. This was after 78 minutes against an enormous Springbok team in a physical game played at altitude. Who did he pass it to? That’s right – Sur Rutchie, roaming the plains and fighting in the trenches. What a great player! My abiding memory of McCaw was when Ireland toured there in 2008. He had a sit down with Roy Keane in the week of the first test. That game was NZ ‘s first test since the harrowing experience of being beaten by France in the quarter finals of RWC07. At the time, Anton Oliver had compared it to No Man’s Land at Passchendaele. Maybe not. That knocked the stuffing out of a lot of players who took the opportunity to pad out their pension in the Northern Hemisphere while the euro and sterling were riding high against the Kiwi dollar. McCaw stayed, and put in a shift in that first test which was incredible. His direct opponent was David Wallace, a Mole favourite. Wally was joined by Leamy and Heaslip so Ireland were pretty useful themselves. McCaw played them off the park and set a standard for what it meant to him to represent the All Blacks. A number of high profile players had moved on but the All Blacks endure and set their own standards. 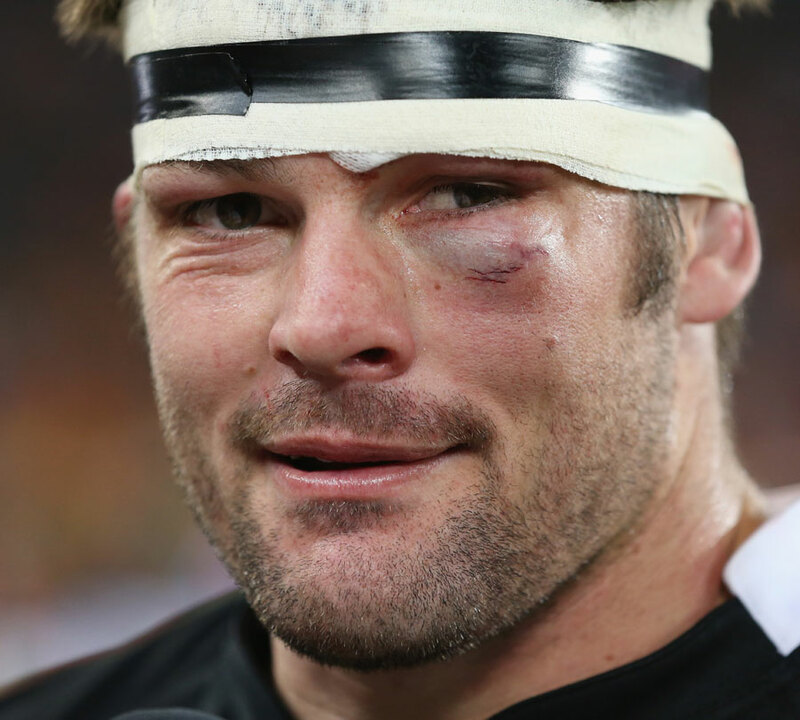 The Kiwis’ triumph in 2011 owes much to the mentality engendered by McCaw. Should McCaw make it to the 2015 RWC, it will be 14 years after his international debut. Developments in technology have made travel easier and increased TV’s demand for test matches. There are far more test matches now than there used be so the number of caps isn’t a fair comparison. However, the seasons still remain the same. Colin Meads made his international debut in 1957 and retired from the international game in 1971. That’s the level McCaw is at now. Take a load off big fella. This entry was posted in Opinion and tagged greatest of all times, Richie McCaw, sepia toned nostalgia by dementedmole. Bookmark the permalink. Super article Mole, one question though. If Richie is the greatest player you’ve ever seen, where do your put Dan Carter; 2nd best, top 5, top 10?? I’m not doubting McCaw’s brilliance, but I just don’t see any flaws in Carters game & his magic moments are just a level above everyone else’s. From an All Blacks perspective it is McCaw’s leadership that makes him slightly more valuable than Carter. As you say, otherwise Carter is pretty much the perfect player. Good stuff Mole. Rugby is a very difficult game to pin point who is the best player. Different to soccer in that it is possible for soccer players to play in almost every position on the pitch if they are skillful enough. For instance I could imagine Messi playing midfield and up front if not as a full back. In the case of rugby however, it is such a position specific game that the same cannot be said. It is generally the more flash positions that carry the best player title. There is also a big difference between best player and most important. In my eyes Mike Ross is Ireland’s most important player but Brian O’Driscoll is our best. It is also difficult to find a metric for the best player in different generations, which you touched on with the Welsh team of the 70’s among others. The other variable in the best player argument is the team in which that player plays. For me this makes a massive difference to the perception of that player. There are some exceptionally talented players out there, playing with rubbish teams (Mamuka Gorgadze). I always wonder how much better O’Driscoll would have been if he was an All Black? All that said, I have no doubt that Rutchie will go down as the greatest openside and captain, if not of all time, certainly of his generation. Great article and it is clear that McCaw is an unbelievable player, hard to argue against him being seen as the best of his generation, however he does play in the best equipped team out there and so his achievements might be easier come by. Is there a word to be put in for players of similar mentallity and commitment, stunted slightly by their teams limited quality…eg: Sergio Parisee / Brian O’Driscoll? Both of whom arguably have a greater skill set than McCaw yet put in similar heroics around the pitch and offer immense leadership qualities. Cheers for the comments and a few interesting points raised. DC is the best flyhalf I’ve seen and I felt sorry for him that he wasn’t involved all the way through RWC11. He has also come back from a few serious injuries and been on the scene for a while. Longevity is a big factor in my consideration of a great player. Rugbyfix Mike nailed the reason for my contention about McCaw’s place on the podium: his captaincy is superb and the captain has a big influence on a rugby team. Aside from being great at his own job, he improves the players around him, something that’s really important in a team game. https://dementedmole.com/2011/09/14/hi-im-gord-mckinnon/ while players like Hugo Porta and Augustin Pichot left a long standing legacy for Argentinian rugby. Parisse and Gorgodze both play in the French league and while they are important for their teams, neither Stade Francais or Montpellier has dominated the Top14 during their time at the clubs.